One of the many challenges in blasting operations is the management of the abrasives used in blast cleaning. New abrasive needs to be loaded into silos ready for depositing into blast machines, and spent abrasive needs to be removed from the blasting location for disposal. Airblast equipment offers the right solution for the management of your abrasives. 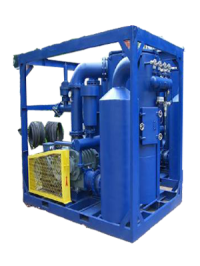 Each vacuum recovery system is designed to be fit for purpose and is supplied with region specific certification. The Airblast vacuum recovery systems are designed to meet present and proposed environmental legislation of dust emission max. 5 mg pr. m³ air. A feature of Airblast ABVR series vacuum recovery system is the capability to vacuum clean any residual dust and abrasive particles from the blast cleaned surfaces to meet the high specifications laid down in National and International Standards of surface preparation.